After having folded this model from transparent paper, I decided this model probably worked better with opaque paper. So here's my fold from elephant hide. I think the picture still doesn't quite show the stars off as nicely as I'd like, and it's not as apparent that in the back you have honeycomb-like dents. But I can say that it is more stunning when you hold it in your hands and look at it. I was wonderin if you can make a video of this model? 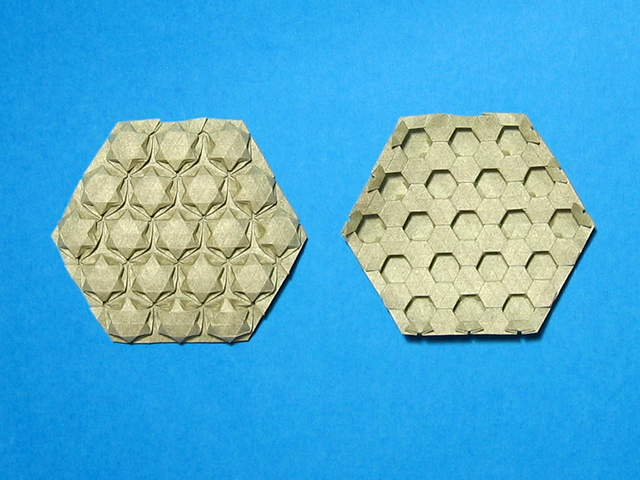 I folded the original three hexagons, then made another in the bottom-left hand corner. i tried to do the same on the other side, but the crease goes right through the other hexagon! Please Help! How many grid divisions did you do for this and could you please explain more on how to bring 19 stars puffed like yours ( in this picture ).Because from the video i could do only three of them. Please do instruct me on hw to do more stars puffed. What do you mean by a 32 grid division. Should there be 32 triangles in all ? no, it means that the length between two opposite edges needs to be divided into 32nds. Then the one you showed in the video was 16 grid divisions right? Yes, for the model explained in the video you need 16 divisions. Just follow the video for placing the triangle twists. And then add more until the whole sheet is basically filled with them. You'll have to open / fold out the triangle twists so that you get a star puff in the center, though. OMG! really beautiful, you dia a great job, congratulations. I made it! Thanks for the instructions. how do you get those pointy edges (when you fold those triangle twists) out of the way? I'm not sure what you mean. Have you seen the instructional video on how to fold the star puff? What section of the video shows what you mean by "pointy edges"? some unwanted parts going along the outside of the hexagon.does this clarify things enough? Well, I just folded them so that I was happy with the pattern on the edge. I basically folded the unwanted paper behind and probably fiddled around a bit to make them lock nicely enough. Take a look at the right part of the picture. It shows the model from the back. In the bottom you can see some partial hexagons. Between those there are some completed hexagons. In the picture it's hard to see that half of the hexagon actually has a second layer, and that the raw edge of the paper isn't quite on the edge of the model. This is where my "left-over" paper went. Please do a tutorial on this!!! Thank you so much for taking the time to have compassion on us mere mortals and doing impromptu diagrams!